Tutorial on how to get anything for free!!! 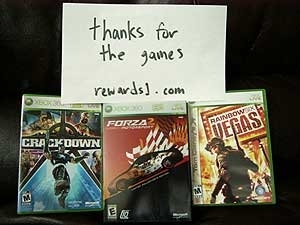 Welcome to Rewards1- Hi and welcome to rewards1 the site that gives you any thing for free. Just work at home and get any thing for FREE!!!! Thats right I said FREE. You can get anything from Wii points cards, and Xbox Live memberships and Xbox live points to ipods, cellphones and if you don't find any thing you like you can custom order a prize off any website. Thats right you can get anything that is from Amazon or Ebay but it must be a buy it now item. But be happy it's all FREE!!! Is this a Scam? Nope rewards1 is not a scam. They don't ask for credit card information. Now if you don't believe me check out Rewards1 friendly forums. Don't be afraid to go onto the forums. How can they afford so much? Well thats a good question. Rewards1 can afford so much because advertisers pay Rewards1 by you doing their offers. How long will it take them to send me my prize? Most sites take like a month but at Rewards1 they process you request within 0-3 days then either email it to you if it has a code or mail it to you which takes about a 3-7 days. Here is proof that the site works.Heres a picture a Rewards1 members posted of there free stuff they got but there are a lot more just check you the "Testimonials" page on Rewards1. So heres how you do it. 2. Once you sign up click Available Offers and do some offers/surveys and wait about 2 minutes and it should give you the amount you earned. NOTE: some can take up to a day to credit. 3. When you have enough points click prize claim center or custom order to request your prize. 4. There is also one more way to get points which is by referring people. Just click on Refer a friend and you should see a url. Just use that url and give it to people and when they sign up under that url, when they do an offer you get 20% of what they make FOREVER. So this is an excellent way to get points. There are many ways to get referrals you just have to think about it. So just do offers and get points and get your prize so have fun getting your free points!